Sold by Glitzy Gift Shop and Fulfilled by Amazon. Gift-wrap available. 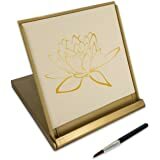 Sold by: Buddha Board Inc.
Superior Quality: Here's the genuine, authentic Buddha Board Enso, made with only the finest high-quality materials. NO BUBBLING, NO PEELING. Count on it. 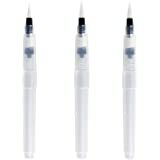 Easy to Use: Simply fill the water brush with water (refillable handle) & start drawing, painting & writing. You'll create soft, beautiful images with a rich, inky Japanese look. Appreciate your creation in the moment, and then as the water evaporates and your masterpiece slowly fades away, practice the art of letting go. Environmentally friendly and lasts for years with proper care. Ages: Five and up. Your complete kit includes our 10" x 10" Enso, sturdy stand (board and case) & water brush (refillable handle). Relaxing Mindfulness: As the water evaporates for the canvas, your newly created images will disappear. Result: a "blank slate" for starting over fresh. Great way to learn the ancient Zen art of living in the moment. 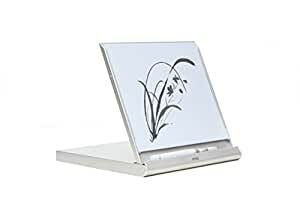 Makes a Great Gift: Everyone from right brain creative artists to left brain analytical executives can appreciate the beauty and simplicity of the Enso. Sold by Glitzy Gift Shop and ships from Amazon Fulfillment. 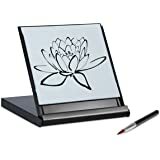 Sold by Buddha Board Inc. and ships from Amazon Fulfillment. Calm your mind while creating beautiful images. 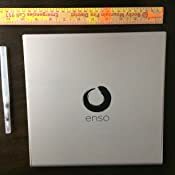 This new product is a sleek silver, modern, and portable enso unit. 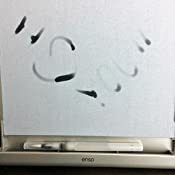 Use the included water brush to paint designs onto the board with water. As the water evaporates your image will fade, but will reveal a new perspective on your creative endeavors, encouraging the Zen idea of living in the moment. 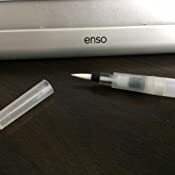 Portable enso unit and water brush included. 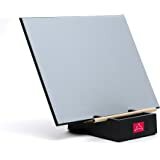 I love this drawing board, it can really put a person in a relaxing place. The one complaint follows what others have said about the paint brush not letting out enough water to actually paint with. The reason I gave the board 4 stars instead of 5 is I had to modify the brush to get the results that I wanted but it's super easy and I recommend you do it yourself as it made a big difference. First you unscrew the water reservoir from the bristle portion of the brush. 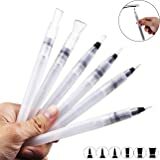 Then firmly grip all the bristles, pinching them together in a way you won't damage them and push them upwards so they and the plastic piece they're within slide towards where the water reservoir was. Next unclick the black plastic piece that kind of acts as a cap of that piece. Once that piece is removed you'll see the non painting end of the bristles, it'll look like melted plastic. I took a safety pin and poked 12 or so holes through that end. 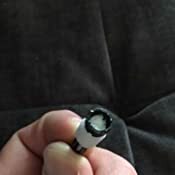 Do it carefully so your holes don't overlap weakening the end of the bristles and if you'd like just poke maybe 6 to start and add more after testing. This will make a huge difference and will make the paint brush work excellent from now on. Enjoy your board, again I absolutely love it. This board is almost addictive. And, it's mess-free! I discovered it at a grown-up's party, with guests dabbling as they passed by, then moving on. Everyone was left feeling artsy. No one had to worry about spills or clean-up or the clutter of amateur art experimentation. I immediately got one for my 6yo. She maybe could scratch the board or feed the brush to the dog, though she hasn't damaged it yet, and we've had it for about a year. I can let her enjoy it without much supervision, and it's just as appealing to her as it was to the adults at the party. 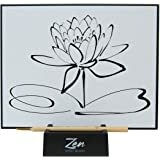 5.0 out of 5 starsBuddha Board fun for all ages. 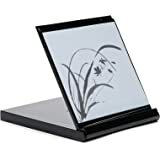 This version of the Buddha Board comes with a refillable brush. 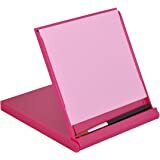 This makes the Buddha Board completely portable. Don't need a near by water source to use. Keep it in your car and when you take a break outside - open it and you're ready to go. 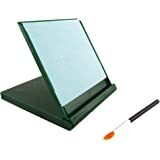 Got my first Buddha Board as gift - and find it a great activity to clear my mind. My grandson (2 years old) saw me using it and had to try it. This new design makes it a truly portable & mess free activity - even with children. I saw this and thought it would be a nice way for my son to chill out when he’s frustrated. I opened it today and it was extreamly difficult to open and it didn’t open correctly and the hinges on the side were broken so it doesn’t close nicely. I will be returning and I’m on the fence if I want to get another one. I bought this as a Christmas gift for my 21 year old brother last year. He opened it here with me and we were all wowed by this cool drawing board. He closed it up to take it home, and the hinge broke into pieces. He closed it normally without force, but this was apparently built poorly. I returned it for a refund. Disappointed. 5.0 out of 5 starsGooda Buddha! Price is a little high for what is is. But still like it a lot. Very well made, good looking and lovely to practice brush strokes. Even better if used with a larger watercolor brush like a 3/4 inch silver black velvet oval and distilled water. This was a great gift for a nephew in the hospital. A grown up. But it was a pleasant distraction and he took pictures with his phone of his drawings. Good value. Relaxing.